Wald, Ruhnke & Dost Architects, LLP started with Don Wald, whose lifelong love of the Monterey Peninsula began in his late teens while he was stationed at the former Fort Ord U.S. Army base. Upon his honorable discharge as a Staff Sergeant, Don returned to his home state and studied Architecture at the University of Illinois. Even after his studies were interrupted by his service in the Korean War, Don completed his bachelor’s degree at U of I. After graduating, Don developed cutting-edge construction methods for locally built modular churches, hundreds of which were shipped across the United States. During an assignment as field superintendent in California, Don and his wife Cynthia decided to relocate to the Monterey Peninsula. Don Wald & Associates established. Don opened his own office in Pacific Grove in November 1963 and immediately went on to design a number of well-loved local landmarks including the Gateway Center, Sally Griffin Senior Center and an addition to Pacific Grove’s Natural History Museum. 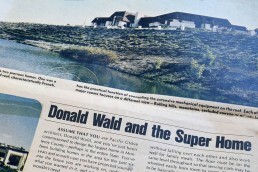 Don also designed a 20,000-square-foot “Super Home” which, at the time, was the second largest home in California – after Bob Hope’s. In 1970, Don moved his office to Downtown Monterey, where he led the design of more than 2,000 Central Coast projects. The birth of a partnership. 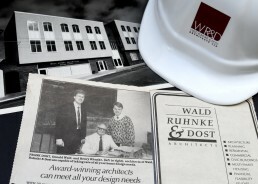 Upon retiring in 1994, Don hand-picked employees Henry Ruhnke and Frank Dost to lead the firm. Within a decade, the two new principals expanded WRD Architects to one of the largest and most successful firms in Northern California. To accommodate the firm’s growth in 2005, Henry and Frank established WRD Architects’ present-day 2340 Garden Road location, near the Monterey Airport and Ryan Ranch, an adjacent commercial business park district, which now features 19 buildings designed by Henry. Reflecting the firm’s increasingly public focus, WRD began to develop many significant civic facilities on the Monterey Peninsula, including the Monterey County Health Department and Tynan Village. Stepping into the future. In 2010, Henry embarked on an ambitious plan to revitalize Downtown Monterey and established the guiding principles of the Downtown Specific Plan. He also began to plan for change and growth within the firm, and named Christopher Barlow as fellow principal when Frank Dost retired in 2014. With a diverse background designing everything from Tahoe lodges to Bay Area hospitals, Christopher continues the firm’s proud tradition of civic engagement and community based-design, with a particular focus on nonprofit and medical clients. WRD Architects continues to grow while remaining committed to Don’s creative and innovative example as well as his love for the Monterey Bay community.